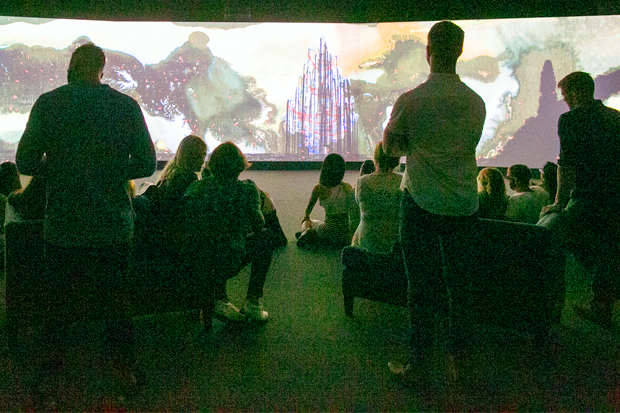 Editor’s note: There are just three weeks left to see the video installation Shahzia Sikander: Parallax. Israeli playwright Tali Ariav, who recently moved to Honolulu from Guam, was so intrigued by the work that she wrote about it and generously shares it with us on our blog. Parallax is on view through July 30. A day after I visited the Honolulu Museum of Art’s exhibition Parallax, an impressive animation art piece created by the internationally acclaimed Pakistani artist Shahzia Sikander, I caught a snippet of one of my new favorite podcasts on NPR, Radio Lab. The podcast featured conversations between the hosts and communication experts about the concept of satisfaction. One of the highlights of this conversation for me was provided by a Princeton University researcher who specializes in cognitive learning. She noted, “There’s nothing more satisfying than the intensity of the moment of understanding.” Her words resonated with me. Well said, I thought to myself. Isn’t that moment of understanding, that “A-ha!” moment or the “Eureka!” flash of insight, which defines education and learning? Isn’t that sudden burst of connection, the tying together of mind and heart, what ‘love at first sight’ is all about? My thoughts began racing through my head as I pondered the idea…a thought I’ve had in the past, but now with a new twist, a flavor I hadn’t tasted before. I began to think upon the intensity of the moment of understanding and what it means…and to ponder the role of this moment in the world of Parallax’s art and message. As humans, I believe we ultimately seek harmony and peace. Sometimes that flash of knowledge can rapidly propel us along the road to this elusive goal—even if only a sometimes frenzied pursuit of a calm ideal—people, mankind, we don’t just want to know the purpose behind a given idea, we need to know. We need to know the intention behind actions and creations. Art is a story told by the artist, its creator, and its interpretation comes about through our engagement of its qualities. But I couldn’t help but wonder: Is the meaning as important as the process leading to its expression of ideas? Are the details as important as the whole? This conflict between process and product, object and field, was on my mind as I walked through the museum for a second engagement with Sikander’s Parallax. Parallax is a three-channel, single image, immersive audio-visual installation. 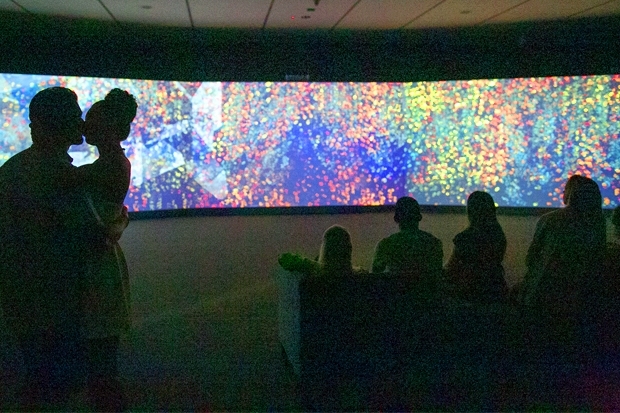 It is presented in a darkened room, projected onto a 45-foot-wide video screen—demanding the viewer’s complete and total attention. As I sat through the 15-minute-long art piece for a second time, I asked myself those same questions about meaning vs. process, the importance of details vs. the whole. Is Parallax about the journey or is it about the destination? Was I allowed to ask this question experiencing this piece? There was no single set of rules to guide me through those 15 minutes. At the same time, I did not feel invited to participate in the world presented to me on the screen, which was composed of hundreds of digitally animated images taken from Sikander’s previous works, woven together with music and sound. A sofa and two benches in the empty, dark space are available for spectators, stationed in front of the curved screens like three silent observers to the continuously looping animation. The space is definitely minimal, allowing the viewer to concentrate on the content and form of the story presented on the screen. As I watched, texture, sound and movement came to life on the screen in front of me, threatening politely to step out of the screen’s boundaries in order to tell me the story in person. In an unpublished interview Sikander describes the art piece: “from land to ocean, from light to dark, from interior to exterior, the outsider can be the insider, the hostile can be loving, death is rebirth. Literature is all about imagination. Imagination is life. Lack of imagination is death.” Was I mistaken by not trusting my imagination enough? I was frustrated with myself. I didn’t understand! Upon both of my viewings of Parallax, I entered the dark space of this exhibition and passed by the writings on the wall without reading the introductory words, preferring to first trust my visual reception of my experience to lead my journey. Is my experience dependent on the artist’s intentions behind the piece? Or would I be led (or misled) by encountering the text before encountering the work itself? An immediate experience is usually defined by a physical sensation, a visual image, a thought and an emotion. All elements are present or numbed, depending on the spectator and upon the experience itself. Witnessing Parallax, one’s thoughts and emotions are active, as well as the tension between a single thought and the emotion it raises. For example, the visual image of the oil streams dripping down the screen triggered the connotation of the visual of human blood. I immediately thought about war. The spoken Arabic poured out across the images, sourced from three separate voices, and it congealed this idea in my mind. Is Parallax about war? The audio component of the art, the reciting poems and narratives in Arabic, becomes louder and the visual symbols grow stronger through subtle and massive repetition. The sound of musical instruments and words pierces through the space and into my ears. How important is it to understand the language recited as a backdrop to the kinetic, changing animations? I started to feel alienated from the piece. Is this the goal sought by the artist? Was I in a world without rules? Was I allowed to be confused? Did the artist intend to make us understand her creation, or was she hinting at something more subtle and unclear? What was the primary message? Recognizing symbols in the video, such as a map of the USA, Christmas trees and thousands of pieces of hair at different points throughout the art piece, provided more clues—and more puzzles. As every good story does, Parallax raises questions rather than feeds us with the answers. I found myself struggling to surrender to the story in order to dive into its world and its rules. Understanding the rules in which this world operates seemed crucial. Are the rules clear? Is this world inviting the spectator to join it? Griffiths claimed the English translations of Chekhov’s works achieved a conventional way of being read and received. This occurred by creating a shift in the main meaning of the drama piece, by revising the thesis of the original thinking, and by writing through the translation process of the same piece. By contrast, Chekhov himself did not believe a non-Russian audience could possibly understand the full meaning of The Cherry Orchard. I find this concept extremely interesting as it is strongly similar to my experience absorbing Shahzia Sikander’s Parallax. Would my experience of the piece be different if the Arabic voiceover was translated into English? Or into another language I understood more clearly? Parallax, according to Sikander, is a journey. It represents creation of an “emotional map” that leads us along the journey. But does Sikander really permit us to experience our own personal journey amongst the elements comprising that emotional map? Prepare to ask questions. Prepare to be surprised. And with luck, you’ll encounter that “A-Ha!” moment, and your preparations will bear the fruit of understanding a powerful, complex and challenging video animation artwork. June 12, 2017. Tali Ariav is a playwright, translator, teacher and a performance artist. She recently relocated to Honolulu after living in Guam for nearly six years. Tali is currently an Adjunct Professor at Hawaii Pacific University. She earned two Masters of Fine Arts degrees in Literary Translation and in Playwriting from the Playwriting Workshop at the University of Iowa. Born and raised in Israel; Tali speaks, writes and reads English, Hebrew, Arabic and Portuguese. She was one of the founding members of Orto-Da, an award-winning Israeli street theatre group. Their 1999 performance of Meta-Rabin, an original, collaboratively written and performed street theatre work, won First Prize at the Akko Theatre Festival in Israel, followed by earning First Prize for Street Theatre at the Chalôn dans la Rue Festival in Chalôn, France. Learn more about Tali Ariav. It seems contradictory to pose the question “But does Sikander really permit us to experience our own personal journey amongst the elements comprising that emotional map?” after the author has presented her own detailed personal journey through the exhibit. Also I did not sense any “conflict between process and product, object and field” in my experience of the exhibit. I perceived a melding of all aspects of the process with the created art. I brought my life experience to Sikander’s work and found myself folding parts of my life into her work. Many thanks to Honolulu Museum for bringing Sikander’s vision to Hawaii.